When you follow advice from the Twitter crowd, you don’t always know what you’re getting into. You might end up eating something you had never contemplated before. Like fresh goat meat in a bowl of spicy curry sauce. When I decided to attend an afternoon presentation at the Marpole Historical Society last Saturday, I asked my Twitter followers for restaurant suggestions in the area. 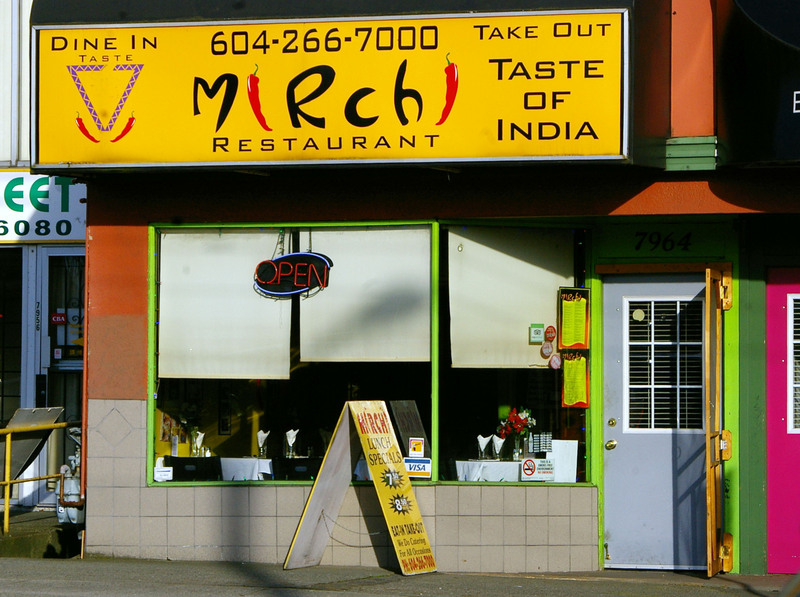 The Marpole Business Improvement Association recommended an Indian restaurant called Mirchi on Granville and 64th Ave. I love Indian food, so I decided to give it a try. I arrived at 4 p.m. and found the restaurant entirely to myself. I was seated in a sunny place at the window. Although I am an omnivore, my diet is 80 per cent vegetarian. I am a reasonable cook, but I perform poorly at most meat dishes, which is why I always want to learn from my rare restaurant outings. 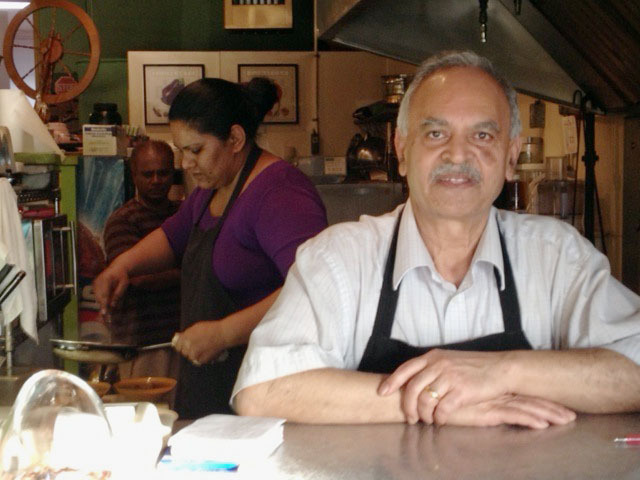 Joe Samuel is the owner of Mirchi since 2006. Mirchi was opened in 2006 by Joseph “Joe” Samuel and his wife Parveen. Samuel is a Catholic from Pakistan, who has worked as a chef in Toronto and Seattle and now lives in Surrey. Samuel enjoys Vancouver and said the restaurant is going well in Marpole, particularly after a positive review appeared in a local Chinese-language newspaper. The walls in the restaurant are covered with photos, a testimony of happy patrons. This decoration was the idea of Parveen, who unfortunately passed away two years ago. 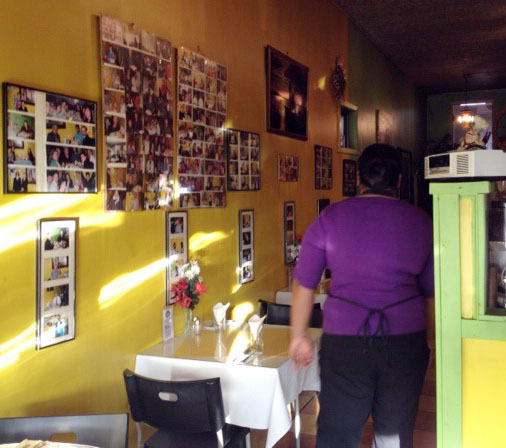 Photos of happy customers decorate the walls of Marpole’s Mirchi restaurant. As Samuel gave me a tour through the restaurant, his assistants came by showing him spoonfuls of turmeric and other, secret spices, that would undoubtedly end up in my curry. The amounts seemed huge. The curries were served in two bowls, together with a plate of rice and ample warm Naan bread. The curries were more spicy than I’d expected and Samuel, who saw the blush on my cheeks, rushed to bring me some white yoghourt to kill the heat. 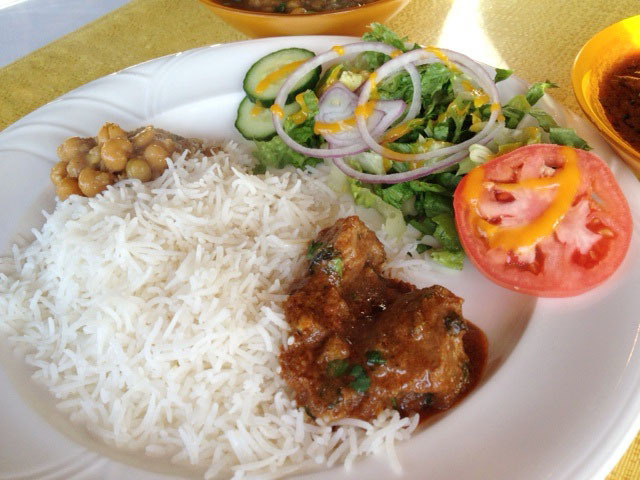 A plate of rice with chick peas (left) and goat curry (right) is a welcome lunch during my visit in Marpole on March 9, 2013. The goat meat, which reminded me of beef stew, was delicious. It was soft and tender, yet the chunks did not fall apart. Samuel bought the meat in Surrey, but wasn’t sure if the goats were actually raised locally. His lamb meat originates in Australia, he said. Goat meat was never a dish in my Belgian family, but it is, as I found out, eaten around the world. Sometimes called “chevon,” in the U.S. to euphemise the origin of the meat, goat meat is also called “cabrito” in Spanish and “mutton” –a common denominator for goat and sheep meat– in English-speaking Caribbean countries and in some parts of Asia, including Pakistan and India. Goat meat is classified as a red meat similar to lamb and is generally considered healthy. It is lower in fat than chicken, but higher in protein than beef, according to the Livestrong foundation. 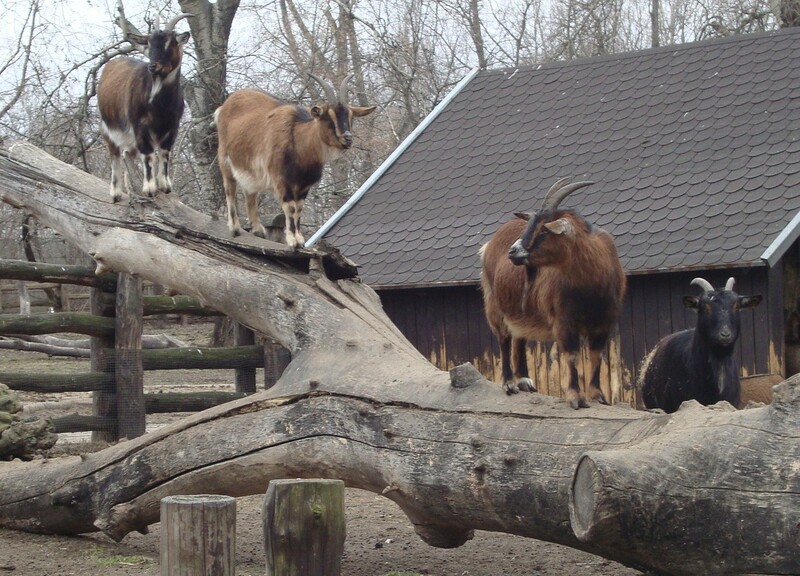 In Canada, goat breeders are represented by the Canadian National Goat Federation. 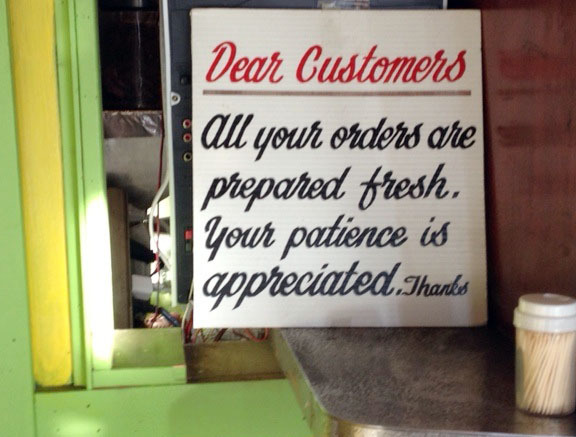 A sign in Marpole’s Mirchi Indian restaurant reminds customers that freshly cooked meals take their time. Compared with meat dishes, vegetarian food sometimes appears flat, and this was unfortunately the case with the dancing chick pea curry. Now, I am a chick pea cook myself and am thus more picky than with meat dishes. Mirchi’s chick peas were falling apart too much for my taste and the raw onion chunks in the curry sauce were odd. The meal was $28 before the tip. Portions were big enough to take home some leftovers. My children loved the meat, but they could eat only one single piece because of the spices. Do you happen to know where I can buy goat meat in southwest Vancouver? Or do you know other interesting eateries in our beat? On a side note – this “goat” song is played in my class room on a daily basis. Goat in trouble! This entry was posted in Food, Marpole, Vancouver and tagged chick pea curry, foodies, goat curry, goat meat, Indian restaurants Vancouver, Katja De Bock, Marpole, Mirchi restaurant, Pakistani cuisine by westsidebeat. Bookmark the permalink. That looks great Katja! I’ll have to check Mirchi’s out sometime. Have you ever had a dosa? I had one for the first time over reading break and fell in love. Thanks Kayla! What’s a dosa? It’s an Indian crepe with potatoes and spices inside. You can order different kinds, so some will have onions (masala dosa) and you dip the crepe into different sauces. I LOVE DOSA! We’re on! The owner of Mirchi told me they have wonderfully crispy Sri Lankan-style dosas. We should try them out! Thanks Kayla, I had no idea! That would be a great idea for a blog post. Compare stuffed crepes from all over the world: Dutch – Polish – Indian and so on.